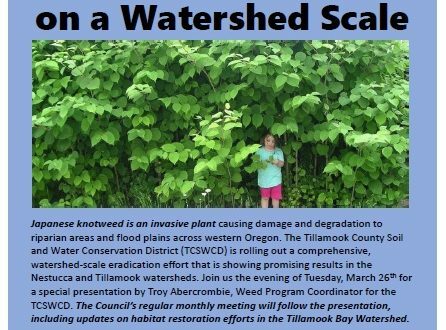 The Tillamook Bay Watershed Council (TBWC) will resume its 2019 Speaker Series tonight, Tuesday March 26th with special guest Troy Abercrombie, Weed Coordinator for the Tillamook County Soil and Water Conservation District (TCSWCD). Troy will give a report on the district’s watershed-scale efforts to eradicate Japanese knotweed from the Nestucca and Tillamook River basins. This approach is showing promising results, and these top-down treatments of watersheds will be expanding to other Tillamook County streams in the coming years. Don’t miss this chance to learn about knotweed treatment from our local experts. The Council’s monthly business meeting will follow the presentation, including updates on our local watershed projects. Doors open at 5:30PM and the meeting will start at 6PM in the Hatfield Room at the Tillamook County Library, 1716 3rd Street in downtown Tillamook. TBWC announces our second Waterfront Work Party on Hoquarton Slough, Saturday April 27th from 9AM to 3PM. Our first event in March was very successful, and we’ve got one more chance to pitch in before the City’s grand re-opening of it’s waterfront parks on May 4th. The City is picking up the pizza and soft drinks, and we’ll bring gloves and hand tools.